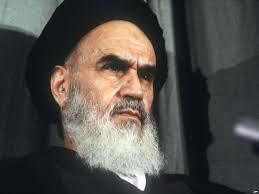 Did you ever notice that all the photos of Khomeini put out for public consumption show a man with a perpetual scowl? They made him seem irritable, angry, even irascible. I used to wonder if he suffered from stomach ulcers, or lived with a contentious wife. I don’t know about the former, and I learned from The Spirit of Allah that he actually felt affection for his lifelong mate, Batool. The truth is that Khomeini did experience happiness at times, but he went to great lengths to cultivate a persona which conveyed seriousness, even joylessness. One of his first acts, upon returning to Iran to direct the revolution after the Shah’s departure, was to make sure that “…only approved pictures of him be printed and displayed” (p. 241). There were two in particular which especially displeased him. “One showed him wearing spectacles, which might create an impression of frailty, if not outright disability. The other showed the Ayatollah smiling benevolently. Islamic tradition maintained categorically that the Prophet never smiled, and dismissed those who did as superficial and morally loose (italics mine). Within a few days all the objectionable portraits of the Imam were replaced with new ones, showing him knotting his bushy eyebrows in a posture of angry determination” (p. 242). Yet the image was not divorced from reality, as far as Khomeini’s understanding of Islam was concerned. He attempted to banish music from the lives of post-revolutionary Iranians. In a speech broadcast nationwide on July 11, 1979, he declared, “Music corrupts the minds of our youth. There is no difference between music and opium. Both create lethargy in different ways. If you want your country to be independent, then ban music. Music is treason to our nation and to our youth” (p. 259). But music was just the tip of the haram iceberg for Khomeini. A month later, in a message broadcast from his home in Qom, he taught, “Allah did not create man so he could have fun. The aim of creation was for mankind to be put to the test through hardship and prayer. An Islamic regime must be serious in every field. There are no jokes in Islam. There is no humor in Islam. There is no fun in Islam. There can be no fun and joy in whatever is serious. Islam does not allow swimming in the sea and is opposed to radio and television serials…” (p. 259). What a sadly distorted vision of life! And what a grotesque picture of God as a slave-master whose goal is make man’s life miserable in this world to see who will gut it out in obedience so as to find sensual reward in the next. How different from the God of the Bible, who creates Adam and Eve in His image out of love and places them in a garden filled with “every tree pleasant for sight and good for food…” (Gen 2:9), and who fills His redeemed people with His presence in the person of the Holy Spirit, one of whose goals is to bring abundant spiritual fruit to bear in our lives – including as of highest priority the first two in the list of Gal 5:22, love and joy! It’s no wonder the trajectories of Christianity and Islam can never merge. The God of the Bible and the Allah of Islam are and will always remain universes apart.